Soldier dressed in an U.S. Spanish-American War uniform stands with his proper left leg forward, bent and resting on a pile of rocks. With his proper right hand on the trigger, his proper left arm rests on his leg holding the barrel of his rifle. 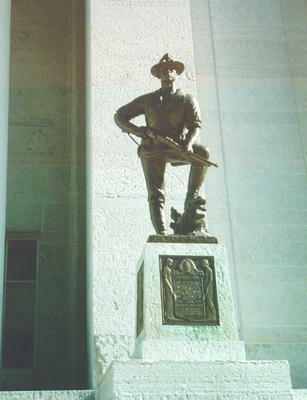 : J. Wouch, “The Spirit of '98,” Ohio Outdoor Sculpture Inventory, accessed April 22, 2019, http://oosi.sculpturecenter.org/items/show/741.